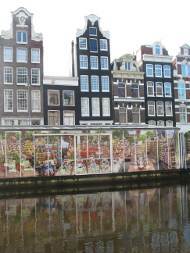 The Amsterdam Flower Market ("Bloemenmarkt") is a market with florists and flower garden shops in the city centre of Amsterdam between Koningsplein and Muntplein. It was founded in the year 1862 and has become a tourist attraction. 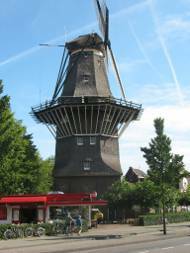 The windmill "De Gooyer" in Amsterdam. From Gorinchem an intersting boat trip can be made to Castle Loevestein (in Dutch: Slot Loevestein). The massive stone fortress is situated at the exact spot where the rivers Maas (Meuse) and Waal unite to form the river Merwede. The castle was built between 1357 and 1397 by the knight Dirc Loef van Horne, hence the name "Loef's stein". Several times the castle served as a jail, the most illustrious prisoner was Grotius (Hugo de Groot) who escaped by hiding in a book chest. The real inaugurators of Dutch portraiture were Mierevelt, Hals, Ravesteyn, and De Keyser. Mierevelt (1567-1641) was one of the earliest, a prolific painter, fond of the aristocratic sitter, and indulging in a great deal of elegance in his accessories of dress and the like. He had a slight, smooth brush, much detail, and a profusion of color. 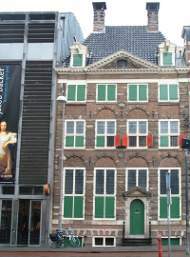 The Rembrandt House Museum ("Rembrandthuis") is a house in Jodenbreestraat in Amsterdam, The Netherlands, where Rembrandt once lived and painted. Rembrandt purchased the house in 1639 and lived there until he went bankrupt in 1656, when all his belongings went on auction.